This down-to-earth, adventurous couple loves spending their free time backpacking, mountain biking, and sailing. 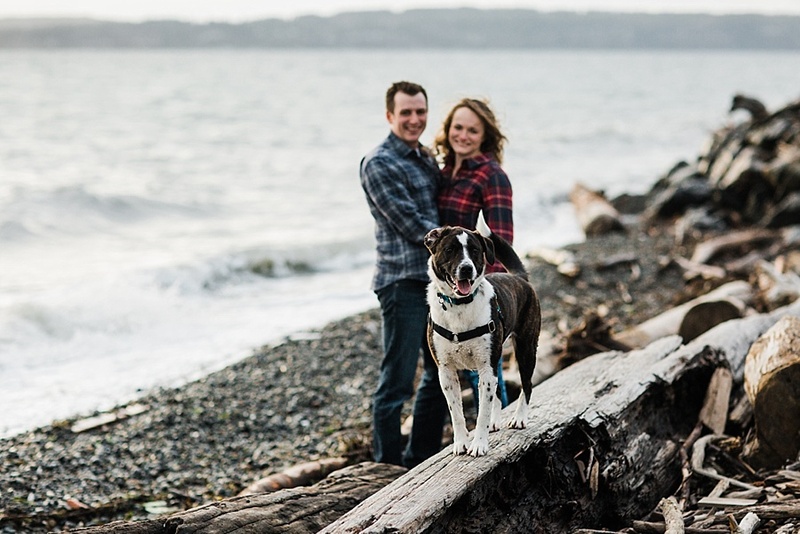 A nurse and an engineer, they live in the greater Seattle area and have an adorable fur-baby named Max (who is also quite the model as you’ll see below!). Nick popped the question while they were on a vacation in Kauai and now they are planning their wedding at Port Townsend in September. I can’t wait to be a part of it! We took their engagement photos at Discovery Park, a place where Erin loves to trail run. A mix of Puget Sound views and crashing waves, it was the perfect spot to take a stroll, take some photos, and get to know more about them as a couple. Cold winter weather meant we had the park to ourselves. Despite the blanket of clouds we started with, we were lucky to have the sun pop out right as we were making our descent to the beach. The wind was blowing hard, the tide was high, and the waves were crashing on the shore. It resulted in some gorgeous romantic photos that truly represent the Northwest. Congrats to these two, I’m so excited to celebrate with you this fall!